I received the eBook Travel Kits from the Old Schoolhouse Magazine for my first official Crew review. 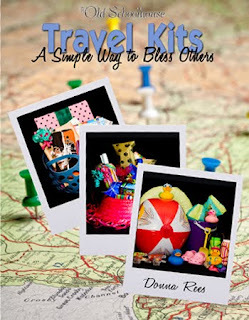 This 93-page eBook by Donna Rees has a multitude of ideas to bless someone who is planning a trip. This book is not about shaving kits for Dad. It is a book that has the who, what, why, where and how-to for personalized bundles, you create for any traveler. Travel Kits is filled with clear instructions and fabulous color photos for the visual learner me. I used it with my family as it coincided with our two-week camping trip. We needed some treasures for those early mornings times at the campground when noise isn't appreciated. I took some of the inspirations in Travel Kits for my 'bucket of tricks'. I had picked up some Wiki-Sticks, a little Wooly Willy and some army men which I loaded a beach bucket for Little Guy. It is a book that I will re-read before the next adventure our family embarks on. Travel Kits has fresh ideas, not just limited to those on the road. These activities can be used on rainy days or when it's just too hot to send the kids outside. A few weeks ago, I found myself home with 6 kids on a sweltering day. They created the Origami Frogs and raced them. ***Warning: Origami is not for the faint in heart, it takes a special genetic makeup to create these, it skips a generation in my family. *** Thankfully, Travel Kits has excellent step-by-step instructions with photos. My nephew Josh created this little hopping frog for our frog races. That is my kind of traveling pet! Travel Kits contains great recipes, games, book lists, travel tips, tourism links, and practical advice for travelers. One noted section was Traveling with a young teen who is blind. The creative tips for keeping a young teen occupied floored me. This eBook would be a great gift for moms, missionaries or grandparents. This downloadable eBook is available from the Old Schoolhouse Store for $12.45. This book was given to me free of charge for the purpose of an honest review. How nice that you got to use these ideas with your family already! I enjoyed your review.